I keep stopping, just to absorb the beauty surrounding me. Perfectly pristine white snow sprinkled with sparkly glitter stretches smoothly out before me. It is marred only by the ski tracks. Sparkling and blue shadowed, it covers the floor of the woods like a frosted cake–one can only guess what lies beneath the smoothly sculpted mounds and gullies. Here and there I spot the tracks of deer and tinier creatures. A rabbit. A squirrel? Some sort of tiny mouse, his long tail marking where he scrambled. It is quiet here. The loudest sounds are my skis and the crow singing some happy crow song. Vivaldi is light in my ears, and I glide on. 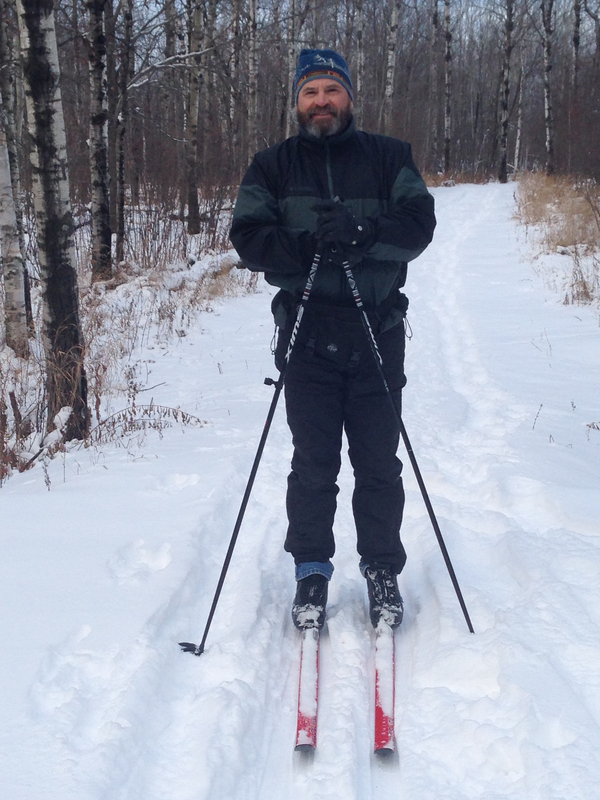 I top a small hill, and as my skis carry me down, my eyes rest on the trees. The white birch, touched by the sun, are like white neon poles standing among the rest of the undressed forest of dignified charcoal greys and browns and black. Here and there small groups of green-needled pine keep watch while the others sleep. As I glide by, I breathe in their breath and I am grateful for them. The sun and the sky are a watercolor wash of blue and buttercream. A few clouds, thinly transparent stretch across the expanse. They look like they are melting into the icy blue water of the sky. At the overlook, I lean on my ski poles and look down on the harbor of my city and beyond to the Great Lake of Gitchi Gummi. Such a busy busy world down there with its ships and train yards, tall stacks spewing white steam marking the industrial plants, business buildings clustered at the center of the long narrow stretch between these bluffs and the water, and houses and highways and bridges spanning the harbor–little tiny cars zipping back and forth. The sun gilds the water golden. It is another water color painting. This entry was posted in Beauty, Courage, Grace, Gratitude, Hope, Joy, Life, Love, Open-hearted, Open-minded, Opening, Uncategorized, Winter, World view and tagged Beauty, Gratitude, Joy, Life, Love, Winter, Wonder on January 19, 2017 by Mary Skillings. Snow. Storm. The Winter King has arrived halfway between the Autumn Equinox and Winter Solstice. Of course, here in the Northland, he’s pretty much expected anytime once the cutouts of jack o’ lanterns come down and the pictures of Pilgrims and turkeys go up. My husband, David, took a photo yesterday while shoveling and posted: “Winter, embrace it or move!” He took photos and brought in wood for the fireplace. I made gingersnaps, soup and bread. Today we went skiing. FaceBook was full of postings today about the weather and the snow–love it, hate it, celebrating it, forgive it. There were pics of cozy fires burning in wood-stoves, people baking cookies and gathering to watch movies. Of course, there were also the sad reports from those who crunched their cars skidding down hills, hit the ditch spinning out on icy highways, nursing strained muscles from shoveling. Then there were the disappointed folks who missed classes and meetings and dates. Shops whose sales were bleak and empty tables at the restaurants. My nephew, Nathan, was born and raised in Bogota, Colombia. Growing up he visited relatives in Minnesota every summer, but only a few times did he come in winter. The first time he was six years old. His four year old sister thought all the trees had died. Down at the park that they played at in the summer Nathan was awestruck by the fact that the water in the river was hard and we could walk on it. “Where did all the turtles go, and the frogs?” he wanted to know. Of course, Bogota is also full of flowers. Everyday. All year. Looking out my window this morning the neighborhood is frosted with white. Not a sprinkle of lacy powder, but the eight inch thick stuff, piled, drifting, blowing. Two days ago there were swaths of gold and burgundy mums in my garden. Shrubs still sported red and yellow leaves mixed with the fading green. The mountain ashes held their scarlet berries up against a brilliant blue sky. The birch had shed their golden leaves into piles on the still green grasses, their white barked limbs glowing in the sunlight. Some apple trees up the road where I went walking, though naked of leaves still held golden apples. I ate one; still sweet and crisp. It was the last of Autumn, the colors bravely holding their own as the season slowly faded. Two days later it’s a black and white world. The only natural color: some red berries, russet leaves clinging hard to a few trees, the green of pine needles the blue sky. Yep, we Northerners talk about the weather. No two d ays quite the same, interesting and full of surprises. Up here Nature is constantly busy parading the cycle of life through our midst, keeping us on our toes, flexible and changing. To be truthful, most of us wouldn’t have it any other way! This entry was posted in Change, Weather, Winter and tagged Change, Colombia, Snow, Snowstorm, Weather, Winter on November 12, 2014 by Mary Skillings.